Class sessions run for 12 weeks. 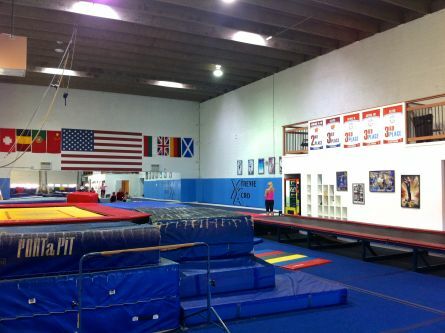 Classes are held once a week, usually for 60 minutes (Tumble Tyke classes are 45 minutes long). You can join at any time during the 12 week session, and your fee will be pro-rated. Class Descriptions are listed below. Please go to our "Forms" tab under our Menu Bar to veiw the full CLASS SCHEDULE and fill out a REGISTRATION CARD. A Registration Card must be filled out to register for a class. You can email the registration card as an attachment to xtremegym@verizon.net, fax it to 301-251-5525, mail in to 14702 Southlawn Ln, Rockville, MD 20850, or you can just drop it off by hand! In Mini Acrobatics, your child will learn age-appropriate progressions of basics gymnastics and more specific motor skills. Students learn basic tumbling skills, body control, and balance, along with acrobatic skills between partners, lifting and balancing each other. In Mini Gymnastics, your child will learn age-appropriate progressions of basics gymnastics and more specific motor skills. 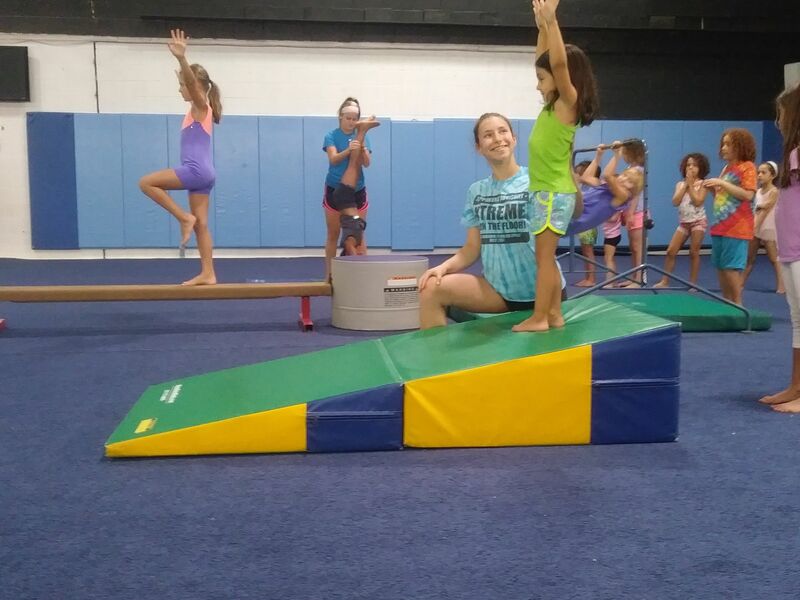 Students learn basic tumbling skills, body control, and balance using the beam, mini bar, trampoline and more. Intermediate Acrobatics is geared towards students with some prior gymnastics related experience who are interested in learning more complex acrobatic partner skills. There will be tumbling instruction as well. Certain prerequisites are required. Please call before registering for this class. Xtreme Acro specializes in Acrobatic Gymnastics, and we have several options outside of classes involving Acrobatics, including our preparatory and competitive teams. Please call for more information on these options or to schedule a free evaluation with one of our coaches. In Beginning Gymnastics, your child will learn age-appropriate progressions of basics gymnastics and more specific motor skills. 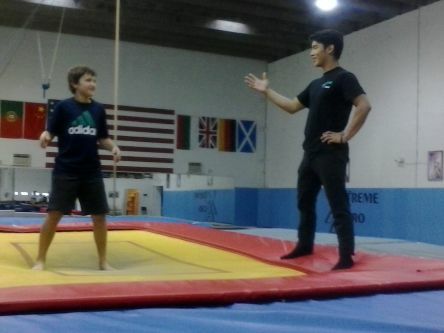 Student learns basic tumbling skills, body control, and balance using the beam, mini bar, trampoline and more. In the Hula Hoop Gymnastics class, students will have fun learning basic gymnastics and dance moves while handling Hula Hoops. *Prices listed are for 1 class a week (same day and time) for 12 weeks. Our Pre Team and Competitive Team include multiple days with a monthly tuition. There are no refunds and no make up classes. Upon request, an open gym voucher can be redeemed for a missed class (2 per session). * If there is space available, students may register for a class mid session for a prorated amount. * Second classes within the same family receive a 10% discount for one of the classes. *For weather cancellations, please call the gym or check the website before coming. OPEN GYM IS SUBJECT TO BE CANCELED DUE TO GYMNASTICS MEETS OR OTHER EVENTS. OPEN GYM CANCELATIONS WILL BE POSTED AT THE TOP OF OUR HOME PAGE, SO PLEASE CHECK OUR WEBSITE OR CALL BEFORE YOU COME. THANK YOU! To schedule a private lesson, contact us at xtremegym@verizon.net, or by calling the front desk at 301-251-5525. You can check out their bios on our staff page to see their amazing credentials!